The personal user experience of wearing a Continuous Glucose Monitor device. 2006 was a watershed year for diabetes management. A unique innovation was introduced to the market that altered the way diabetics can manage their illness. These devices are known as Continuous Glucose Monitors (CGM). CGMs measure glucose levels in the interstitial fluid space below the surface of the skin. A small and flexible wire is attached to a disposable body-worn sensor patch, which transmits measurements in real-time to a phone-sized monitor carried by the wearer. By delivering a steady stream of glucose readings and, when necessary, alerts, CGM has enabled diabetes patients to correct their insulin dosing ratios and head off hyperglycemic or hypoglycemic events before they occur. Traditional finger-prick testing cannot achieve the same. Recently we were commissioned by a client to conduct some research into a CGM device. In a moment of ill-advised curiosity, I volunteered to be the guinea pig who would wear the device and track the progress of my sugars over time. While I am committed to the progress and success of my company, I had some personal motivations in choosing to do this — my father is a Type-2 diabetic, and there is a history of the disease ravaging other members of my family. As you can imagine I am keen to see if there is any sign of dysfunction in my own pancreas. So with all this in mind, I submitted to have a centimetre-long titanium wire embedded into my body for as long as it would last. The following is a catalogue of the experience and my thoughts surrounding the technology. Having a sensor installed into your stomach is an odd experience. Two colleagues and I retired to a secluded part of the office to conduct the procedure in private. We used a helpful YouTube video to guide the process. The video instructed us to select an appropriately smooth part of my stomach that would be a safe place to insert the wire without it being dislodged by the creasing of the skin. An alien looking device was then pressed against the chosen section of my anatomy and through a complex multi-step movement the sensor was inserted into my skin. There wasn’t really any pain, although I was very aware of the sensation that there was a piece of wire inside my body. I could feel it shifting slightly as I moved. The inserter that we used to insert the sensor was something of an oddity. In appearance, it was not dissimilar to a large syringe. So, depending on your attitude to needles, this could either be a neutral issue or a cause of major anxiety. One could not help but get the sense that as you pressed this oversized plastic tube against your body, you were partaking in some sort of bizarre sci-fi experiment. What is undeniable is that the design of the device was un-empathic to the conditions of chronic illness. If you live with a chronic illness, in your own mind you will already be separate from your healthy peers. It seems to me that the medical devices that allow us to manage these issues should be designed to minimise any feelings of isolation and difference. It is not enough to merely create a device that works, our ultimate goal should be to improve the entire experience for the patient, as much as possible. Following on from this the device that accompanied the sensor had to be calibrated. This involved me having to stab my finger with a needle to extract some blood from it and then inserting the sample into a glucometer. In order to ensure accuracy, this has to be done twice, every day for the duration that I was to wear it. This is a pain that all diabetics know too well. 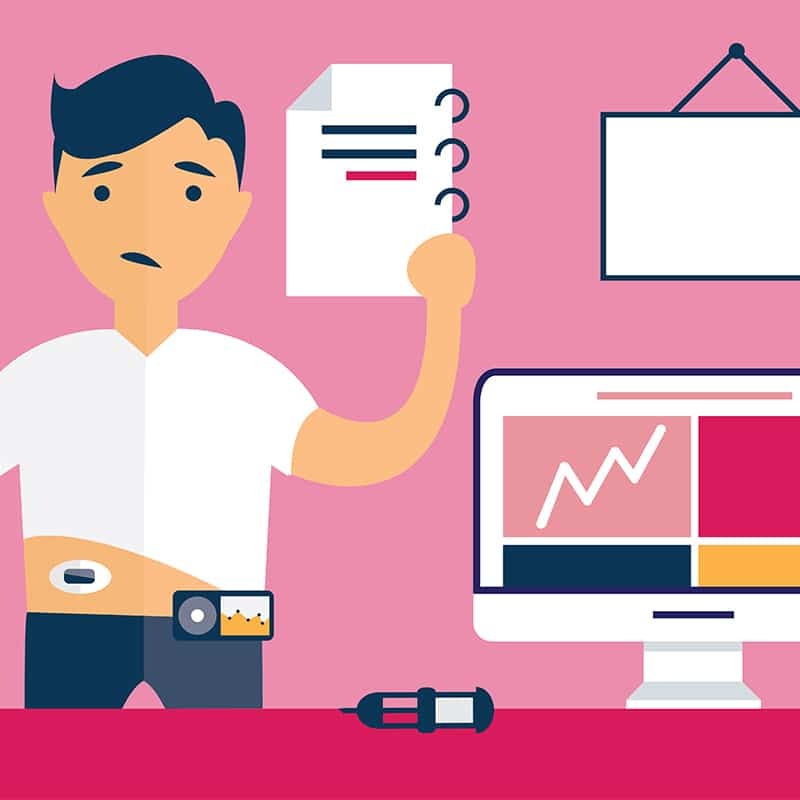 It is a daily fact of the modern diabetic’s life that they have to injure themselves, slightly, several times a day in order to monitor their sugar levels. The promise of CGMs is that one day this irritating inconvenience will be removed from the experience altogether. However, throughout the course of our experiment, my poor finger was perforated like a sieve. My initial interest was in what it would be like to be aware of how much sugar is in my blood. At first, as you can imagine, it is fascinating to watch how the line moves up after you eat and then drops again a short while later. After the initial phase of curiosity though, a type of mild anxiety sets in. You find yourself pulling the receiver out of your pocket at odd times just to see what is going on as if by checking it some new insight into your current experience can be gleaned. All you see, however, is the dotted yellow line plodding along. The readings the sensor gave were not always consistent. Sometimes it would stop communicating with the receiver and there would be periods of sensor silence where the dotted line would be terrifyingly absent from the LCD screen. Until it returned, inexplicably, sometime later. My initial assumption was that I was of course terribly ill and needed medical attention immediately. However, after consulting with my colleague Michelle, our resident medical device designer, she informed me that this can sometimes happen due to dehydration. Note to all consumers of excess amounts of coffee, this will dry out the interstitial fluid under your skin. Be aware. There were also alerts set up on the device to let you know when you moved out of your normal range. On a few occasions over the first few days, the receiver piped up to inform me that my sugars were below 60mg/dl and on one particular occasion it told me I was below 50mg/dl. In this particular instance, I endured a bout of short but intense terror. In the world of diabetes, a reading this low would mean I was hypoglycemic — in serious trouble. I sat for some moments, prone in my chair waiting for a diabetic coma to descend upon my sugar-starved body. The moments passed and my consciousness remained as intact as usual. The only notable symptom of sugar deficiency was that I was slightly hungry. It seemed that my CGM was not being entirely honest with me. However, after the first few days of use, these unusually low alarms seemed to taper off. It seemed it was getting used to me just as I was getting used to it. In the midst of all this fear and anxiety brought on by excess knowledge about my blood sugars, I began to speculate that a dystopian end-point for all this wearable technology and increased self-awareness could be a society of terrified hypochondriacs. As the Greeks told us “Know Thyself”, but perhaps there should be sensible limits to the extent of that knowledge. As the quote from Peter Drucker states at the opening of this article, proper management of things requires a clear understanding of them. Correct diagnosis and management of diabetes have historically always been tied to the measurement of sugar levels in the body. The technology has come a long way. In the 19th century physicians used to test for diabetes by tasting a patient’s urine to see if it was overly sugary. Contrast that with today’s glucose monitors and you will see that we are truly living in a golden age of medical technology. However, as anybody involved with statistical analysis will tell you, measurement is important but being able to correctly parse the information is even more essential. My experience of wearing a CGM was fascinating, but I was left with the sense that there is still work to be done in this domain to provide users with the ability to correctly understand and use the data that will come from their CGMs. In addition, the design of the artefacts of the system, particularly the inserter, could do with some more consideration. As the management of chronic illnesses falls more into the hands of patients, a movement away from highly medical form factors into something more consumer-driven may be the way to go.